HE SHIED away from the limelight some three years ago — about the same time his Creative Technology empire weathered turbulence in the face of a bloody MP3-player battle with United States tech giant Apple and tumbling stocks. 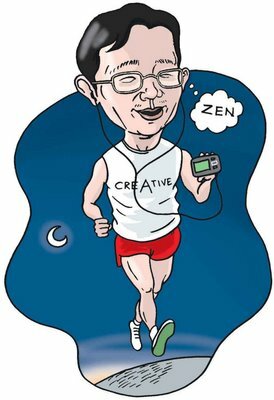 Creative chief Sim Wong Hoo now breaks his silence, saying he’s a new man — thanks to his new-found passion for running. The trim, sporty 53-year-old will take on another challenge on Saturday night, joining some 300 runners — many of them elite athletes — in the inaugural, 84km Adidas Sundown Marathon, which will also see about 6,000 others going half the distance. In his first media interview in three years, he tells ANSLEY NG (ansley@mediacorp.com.sg) about his preparations for the race and how to get creative. You ran your first marathon in December last year, clocking just under seven hours. A month later, you signed up for the 84km ultra marathon. Why? I knew I wanted to take part in it when I read about the event in the papers. I was in no condition to do the ultra marathon. But I always do things when I am not prepared. That’s the way I have achieved things all my life. You don’t prepare and plan, plan and plan, then decide if you can do the task. I don’t do things that way. You actually set a goal, then you go. Then you set bigger and bigger goals. When I set my mind to do the ultra marathon, it was done. There was never a single doubt in my mind that I couldn’t do it. I signed up, and worked towards it. Have you always been running? I was never a runner, never an athlete. I had an embarrassing experience when I was young, when I attempted a half-marathon (21km) with some friends during my National Service. This was 30 years ago. It was one of the first few times Singapore had organised such a race, so there was not much support. We didn’t prepare for anything. We just ran until we couldn’t any more and started walking. Halfway through, my friend and I decided to have breakfast, after which my friend gave up and went home. I continued and walked to the finish. When I got to the end, there was nobody there. There was nothing left, even the street was cleaned up. I don’t know how long I took, but it felt very long. I persisted to the end, but there was nobody there. Is there a reason you are looking for such physical challenges? I want to be a new person. I want to be young again. When you are young again, you have a second life. Now, I am more energetic than some guys in their 20s. I have been driving the company crazy. What’s the longest distance you’ve run so far? Fifty kilometres, which took about seven hours and 26 minutes in training. Also in training, I’ve done about 170km — the equivalent of four marathons — in 10 days. I run, I am working. I am most productive when running. I am the least productive when I’m here in the office. But when I am running, I am solving all the problems and setting all the big strategies. Every time I go out for a run, I come back with some new ideas that need to be implemented. But when I’m in the office I get distracted, emails and people disturbing you. A lot of people cannot understand the joy derived from running. Why do you do it? Once, I had a problem with an invention, an IT type of product relating to imaging. I had been thinking about it for more than 10 years, and I didn’t have a solution. But in 20 minutes — while running — I found a solution. When I came back, I got my lawyer to file a patent. My lawyer is now stressed. He has 20 to 30 patents behind him, ideas that came up while I was running. The long distance can be boring. I am either counting my footsteps, or I start thinking about everything else — work, the world, the rising cost of food prices, the environmental problems we are facing, everything. You are in sync with the universe when you do that. Some people meditate (to achieve that), but I run. Do you follow a particular diet now? No. In fact, I am more prone to eating rubbish now. After a run at East Coast, I go to McDonald’s and reward myself with McWings. Normally I don’t take food like that, but now I can afford to.